"Do you think it is possible for dogs to stop war? Author Robert J. McCarty has created a charming fantasy-allegory that can be read and understood on at least two different levels…a story about dogs who come from another planet to help people on earth. But under the surface are the important messages of friendship, love, loyalty, and how to overcome evil with good…Castle In The Mist will keep you turning the pages to find out what happens next." Reviewer-Children and Teens Book Connection; and Editor in Chief of Pages & Pens. "Loving, brave dogs come to Earth to help oppressed forest people; in this fantasy of kidnapping and war. Short, inviting chapters keep the pace going. And, in spite of war, an underlying atmosphere of kindness prevails; there is little actual violence. Especially fine illustrations add much understanding to the text. Young people, who want a fast read, will probably zip through the story and ask for more." "Castle In The Mist is one of those unique sequels that is even better than the first book in the series! Full of danger and suspense, it's an exciting and compelling story that will keep young readers rapt." "Castle In The Mist is a good book like the first one, Planet Of The Dogs. I can’t wait for the next book to appear. The plot is good and so is the problem  how two former enemies unite is one of the things that I liked. On of a scale of 1 to 10, I will give it a 10." "…What I love most about Castle In The Mist, as well as the other books is that the focus is mainly about the dogs and how they change the hearts of adults through love, affection, companionship and devotion. From the beginning we were always rooting for the dogs to succeed in their mission of saving the children without having the conflict turn to war. … this one seemed like an insurmountable mission for the dogs and would they really be able to succeed this time?... It is well worth reading! If you have children that love animals, especially dogs, or if you want an easy Sunday afternoon read for yourself be sure to pick up all of the Planet Of The Dog books! " "I liked how the dogs in Castle In The Mist were once again successful in winning over the mean leaders. The dogs are clever, brave, helpful, loyal and loving. I recommend this series for children ages 6-12 and for dog lovers of all ages." 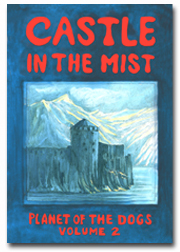 "Castle in the Mist did not waver at all in delivering an exciting and heart-expanding sequel. It is a story we both (mother and son) enjoyed and learned from -- the McCarty's again succeeded in bringing archetypal themes such as good vs evil, man vs nature, love, faith and faithfulness into the story without being overly teachy or preachy. We were riveted by the story and its main characters (both human and canine); we shared in their challenges and celebrated their victories." "There are touches of humor in both books, particularly in the description of the Planet of the Dogs. Children will enjoy the names of their homes, such as Poodletown, Muttville, and Hound Dog Hamlet. The dogs sing, and grow dog food on trees. And, there are messages of love and peace in both Castle In The Mist and Planet of the Dogs. In addition, the stories teach children what dogs give to people; their power of smell, the ability to work together, their loyalty, and the power of love. Most of all, the Planet of the Dog books are about the power, and importance, of love."